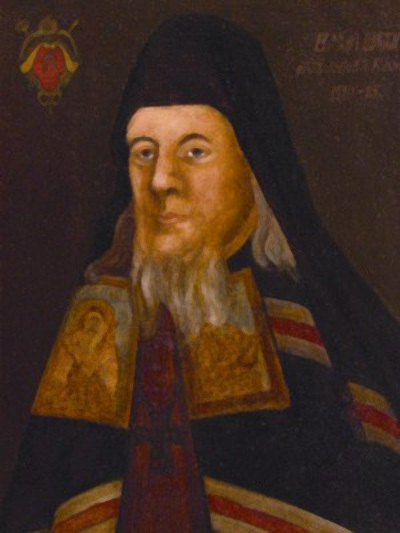 Sheptytsky, Varlaam [Шептицький, Варлаам; Šeptyc’kyj] (secular name: Василій; Vasylii), b 3 February 1647 in Voshchantsi, near Sambir, Galicia, d 5 April 1715 in Univ. Uniate bishop. He entered the Orthodox monastery at Univ and in 1668 was elected archimandrite. In 1669 he established the Univ Monastery Press, which published many important monographs and religious texts. Together with Bishop Yosyf Shumliansky of Lviv he soon began working toward extending church union (see Church Union of Berestia) to the Lviv eparchy. He participated in the Colloquium of Lublin of 1680, led by the Uniate metropolitan of Kyiv, Kypriian Zhokhovsky. After converting to Catholicism in March 1681, he defended the Uniate position at the eparchial sobor of 1694, and in July 1700 he participated in the proclamation of the Union in Lviv eparchy. After Shumliansky's death (1708) Sheptytsky was nominated as bishop of Lviv by King August II Frederick. He was elected bishop in January 1710 at a congress attended by the Kyivan metropolitan, Yurii Vynnytsky, and representatives of the Ukrainian nobility, the Lviv Dormition Brotherhood, and the clergy; he was consecrated in June 1710.